Back when Brad and I first started dating, I had less than zero interest in anything football related. It all seemed the same to me: run a little, crash into each other, fall down, do it again. Still, because I loved him so much, I gave in and watched a game with my boyfriend. We were sitting on the sofa in the house he shared with several other college boys. I stretched out just as the game began. Five minutes later I was sound asleep. And I stayed asleep for the entire game. These days I'm a least slightly more interested. Between watching a 2 year old cheering for Peyton Manning and the excuse to make delicious snack foods I can remain entertained. I've realized during this football season that has been so amazing for the Denver Broncos that I enjoy watching others enjoy the game more than the actual event itself. I guess that's the beauty of sports. In a time when we are distracted by smart phones, computer screens, video games and more, anything that brings people together to spend time cheering, laughing and eating together is worth it. I've been traveling for the last week and a half, so I'm looking to keep this weekend as simple as possible. This white chili skillet dip is perfect if you have last minute guests coming over to watch the game or if you just want something that doesn't take tons of time but brings the classic flavors people expect during the big game. What I love about this appetizer is that it's a little more elegant than the typical cheesy chili dip with tortilla chips. Serving it in a classic cast iron skillet lends a nice touch. The simple combination of onions, garlic and green chiles make the perfect base. 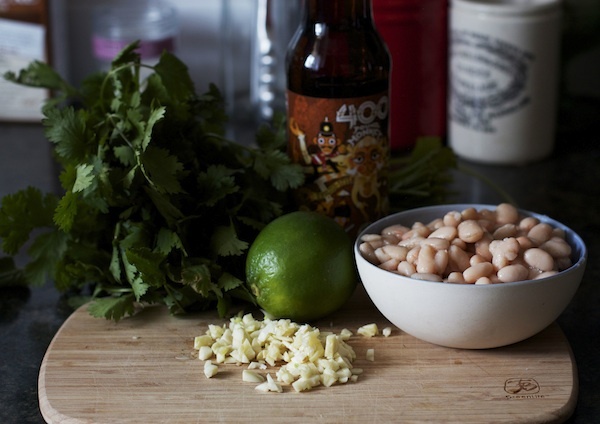 A little bit of beer (I used an IPA) reduced down to concentrate the flavor and give the white beans an extra boost creates the most delicious contrast to the creamy cheese. After some time in the oven getting bubbly and golden, the dip is sprinkled with fresh cilantro and drizzled with lime juice. 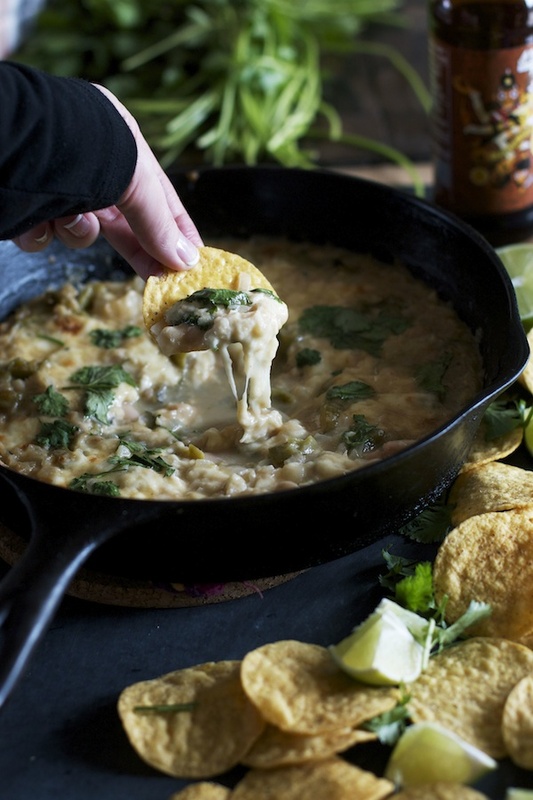 Scooped up with salty tortilla chips, this dip was made for game day. Heat the olive oil in a cast iron (or other oven proof) skillet over medium heat. Add the green chiles, jalapeño (if using), garlic and onion to the skillet and heat until softened and fragrant, 2-3 minutes. 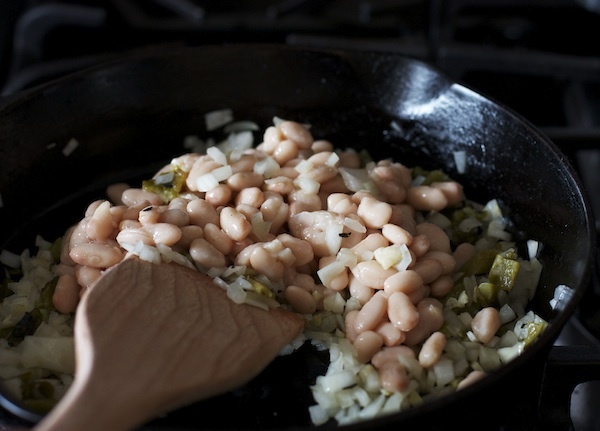 Add the beans to the skillet and stir to combine. Pour the beer into the skillet and bring to a boil. 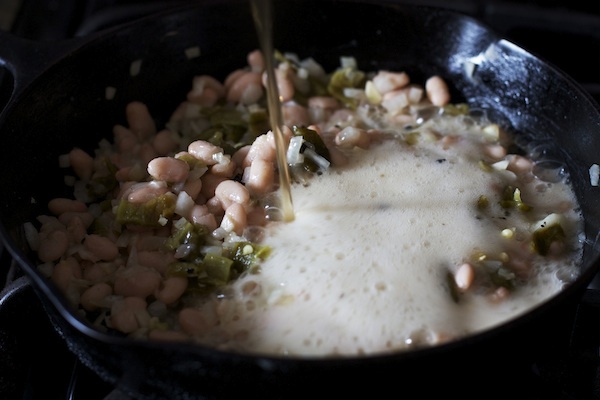 Reduce the heat and simmer until the liquid has reduced by nearly half. Transfer the skillet to the oven and bake for 20-25 minutes or until the cheese is bubbly and beginning to brown on top. If needed, set the broiler to low to brown the cheese a little further. Sprinkle with fresh cilantro and lime juice. Serve the dip piping hot with tortilla chips on the side.